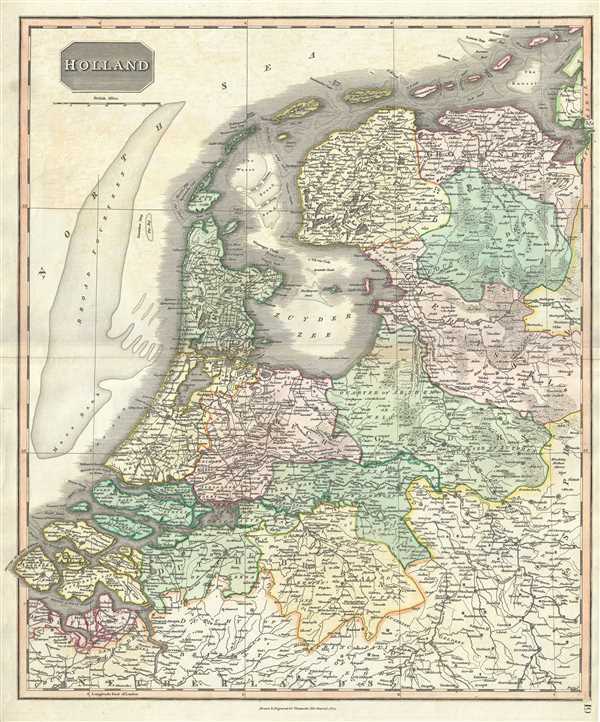 Early map of the Netherlands with beautifully rendered coastal features. This beautiful hand colored 1817 map of Holland by Edinburgh cartographer John Thomson is beautifully engraved in the minimalist English style pioneered in the early part of the 19th century. The Broad Fourteen sandbar, scene of countless naval battles, is shown here by fine stippling. Relief is shown by hachure with towns, cities, and major topographical features identified. Thomson maps are known for their stunning color, awe-inspiring size, and magnificent detail. Thomson's work, including this map, represents some of the finest cartographic art of the 19th century. Prepared for inclusion in the 1817 edition of Thomson's New General Atlas. Note: The image above represents two separate sheets. John Thomson (1777 - c. 1841) was a Scottish cartographer, publisher, and bookbinder active in Edinburgh during the early part of the 19th century. Thomson apprenticed under Edinburgh bookbinder Robert Alison. After his apprenticeship he briefly went into business with Abraham Thomson. Later the two parted ways, John Thomson segueing into maps and Abraham Thomson taking over the bookbinding portion of the business. Thomson is generally one of the leading publishers in the Edinburgh school of cartography which flourished from roughly 1800 to 1830. Thomson and his contemporaries (Pinkerton and Cary) redefined European cartography by abandoning typical 18th century decorative elements such as elaborate title cartouches and fantastic beasts in favor of detail and accuracy. Thomson's principle works include Thomson's New General Atlas, published from 1814 to 1821, the New Classical and Historical Atlas of 1829, and his 1830 Atlas of Scotland. The Atlas of Scotland, a work of groundbreaking detail and dedication would eventually bankrupt the Thomson firm in 1830, at which time their plates were sequestered by the court. The firm partially recovered in the subsequent year allowing Thomson to reclaim his printing plates in 1831, but filed again for bankruptcy in 1835, at which time most of his printing plates were sold to A. K. Johnston and Company. There is some suggestion that he continued to work as a bookbinder until 1841. Today, Thomson maps are becoming increasingly rare as they are highly admired for their impressive size, vivid hand coloration, and superb detail. Thomson, J., A New General Atlas, (Edinburgh) 1817. Thomson's New General Atlas was first published in 1817 and continued to be published until about 1821. This is the first of Thomson's major cartographic works and the atlas for which is most celebrated. The New General Atlas follows in the Edinburgh School, which eschews excessive decoration in favor of a more minimalistic fact-based cartographic vision, as established by John Pinkerton, Laurie and Whittle, John Cary, and others in the previous decades. The maps are notable for their massive scale, heavy stock, elegant color work, and easy-to-read typefaces. Although the atlas stopped being published after 1821, Thomson continued to offer 'supplementary' maps that could be tipped into the atlas as late as 1830, when he declared bankruptcy. The maps in the Thomson Atlas were engraved by Thomas Clerk, William Dassauville, Nathaniel Rogers Hewitt, James Kirkwood, Robert Kirkwood, John Menzies, George Menzies, Edward Mitchell, John Moffatt, Samuel John Neele, Robert Scott, and James Wyld. Very good. Minor wear along original centerfold. Original platemark visible. Overall toning and foxing at places. Rumsey 1007.020. Phillips (Atlases) 731. Newberry Library: Ayer 135 T4 1817.